There are a number of things about our worship that are different from the services of other churches, whether Roman Catholic, liturgical Protestant, or evangelical. In an effort to help alleviate confusion, here are twelve things I wish someone had explained to me before the first time I visited an Orthodox Church. If you are from a Protestant or non-liturgical tradition, you may fell overwhelmed the minute you walk in the door of an Orthodox church. You will find yourself surrounded by a blaze of color in the priests’ vestments and the icons that adorn the walls. The pungent odor of incense will assault your nose, possibly making you sneeze. Rich, deeply moving but unfamiliar music will fill your ears. All around you people will be doing things–lighting candles, kissing icons, making the sign of the cross, bowing, standing in prayer–everything but sitting still. To someone accustomed to four bare walls and a pulpit, all this may seem pretty strange. It is important to remember that none of this is an end in itself. Everything we see, hear, smell, touch, taste, or do in the Orthodox Church has one purpose and one purpose only: to lead us closer to God. Since God created us with physical bodies and senses, we believe He desires us to use our bodies and senses to grow closer to Him. In the Orthodox tradition, the faithful stand through nearly the entire service. Really. In some Orthodox churches, there won’t even be any pews, just a few chairs scattered at the edges of the room for the elderly and infirm. Expect some variation in practice: other churches, especially those that purchased already existing church buildings, will have well-used pews. In any case, if you find the amount of standing too challenging, you’re welcome to take a seat. It gets easier with practice. To say that we make the sign of the cross frequently would be an understatement. We sign ourselves whenever the Trinity is invoked, whenever we venerate the cross or an icon, and on many other occasions in the course of the Liturgy. But people aren't expected to do everything the same way. Some cross themselves three times in a row, and some finish by sweeping their right hand to the floor. Often before venerating an icon, people will cross themselves twice, bowing each time with their right hand to the floor, then kiss the icon, then cross themselves and bow again. Don’t worry; that doesn't mean you have to follow suit. Not everyone prostrates. Some kneel; some stand with head bowed, or sit crouched over. Standing there feeling awkward is all right, too. No one will notice if you don’t prostrate. In Orthodoxy there is an acceptance of individualized expressions of piety, rather than a sense that people are watching you and getting offended if you do it wrong. We kiss things. When we first come into the church, we kiss the icons (Jesus on the feet and saints on the hands, ideally). You’ll also notice that some kiss the chalice, some kiss the edge of the priest’s vestment as he passes by, the acolytes kiss hiss hand when they give him the censer, and we all line up to kiss the cross at the end of the service. We kiss each other (“Greet one another with a kiss of love,” 1 Peter 5:14) before we take communion. When Catholics/Episcopalians pass the peace, they give a hug, handshake, or peck on the cheek; that’s how Westerners greet each other. 6. Blessed Bread & Consecrated Bread. Only Orthodox may take communion, but anyone may have some of the blessed bread. Here’s how it works: the round communion loaf, baked by a parishioner, is imprinted with a seal. In the preparation service before the Liturgy, the priest cuts out a section of the seal and sets it aside; it is called the “Lamb.” The rest of the bread is cut up and placed in a large basket, and blessed by the priest. During the eucharistic prayer, the Lamb is consecrated to be the Body of Christ, and the chalice of wine is consecrated as His Blood. Here’s the surprising part: the priest places the Lamb in the chalice. When we receive communion, we file up to the priest, standing and opening our mouths wide while he gives us a portion of the wine-soaked bread from a spoon. He also prays over us, calling us by our first name or by the saint-name we chose when we were baptized or chrismated (received into the Church). As we file past the priest, we come to an altar boy holding a basket of blessed bread. People will take portions for themselves and for visitors and non-Orthodox friends around them. If someone hands you a piece of blessed bread, do not panic; it is not the eucharistic Body. It is a sign of fellowship, so that even those who don’t receive communion can share in the common loaf. About seventy-five percent of the service is congregational singing. Traditionally, Orthodox use no instruments, although some churches will have organs. Usually a small choir leads the people in a cappella harmony, with the level of congregational response varying from parish to parish. The style of music varies as well, from very Oriental-sounding solo chant in an Arabic church to more Western-sounding four-part harmony in a Russian church, with lots of variations in between. What keeps this from being exhausting is that it’s pretty much the same song, week to week. Relatively little changes from Sunday to Sunday; the same prayers and hymns fall in the same places, and before long you know it by heart. Then you fall into the presence of God in a way you never can when flipping from prayer book to bulletin to hymnal. The original Liturgy lasted something over five hours; those people must have been on fire for God. The Liturgy of St. Basil edited this down to about two and half, and later (around AD 400) the Liturgy of St. John Chrysostom further reduced it to about one and a half. Most Sundays we use the St. John Chrysostom Liturgy, although for some services (e.g., Sundays in Lent, Christmas Eve) we use the longer Liturgy of St. Basil. When you arrive for Divine Liturgy on Sunday morning, worship will already be in progress and you will feel chagrined at arriving late. You are not late; the priest, cantors, and some parishioners are just winding up the earlier, preparatory services, which began about an hour before. 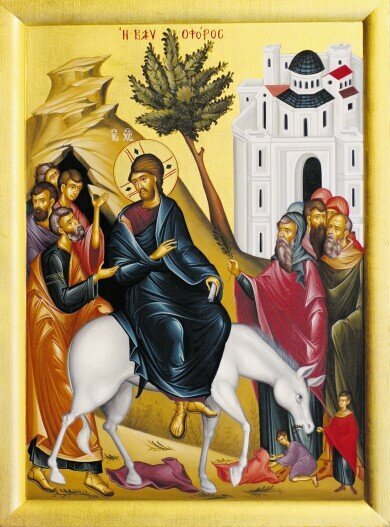 Divine Liturgy follows on its heels, with the posted starting time only approximate. Before Matins, the priest has other preparatory services; he will be at the altar for a total of over three hours on Sunday morning, “standing in the flame,” as one Orthodox priest put it. Orthodoxy is not for people who find church boring. We love Mary, and it shows. What can we say? She’s His Mom. We often address her as “Theotokos,” which means “Mother of God.” In providing the physical means for God to become man, she made possible our salvation. Not that we think she or any of the other saints have magical powers or are demigods. When we sing, “Holy Theotokos, save us,” we don’t mean “save” in an eternal sense, as we would pray to Christ; we mean “protect, defend, take care of us here on earth.” Just as we ask for each other’s prayers, we ask for the prayers of Mary and the other saints as well. They’re not dead, after all, just departed to the other side. Icons surround us, in part, to remind us that all the saints are joining us invisibly in our worship. Every Orthodox church will have an iconostasis (which means “icon-stand”) before its altar. In a mission parish it can be as simple as a large image of the Virgin and Child on an easel on the left, a matching image of Christ on the right. In a more established church, the iconostasis may be a literal wall, adorned with many icons. The basic set-up of two large icons creates, if you use your imagination, three doorways. The central opening, in front of the altar itself, usually has two doors, called the “Royal Doors,” because that is where the King of Glory comes out to the congregation in the Eucharist. Only the priest and deacons, who bear the Eucharist, use the Royal Doors. The openings on the other sides of the two main icons, if there is a complete iconostasis, have doors with icons of angels or deacon-saints (like St. Stephen and St. Philip); they are termed the “Deacon’s Doors.” Altar boys and others with business behind the altar use these, although no one is to go through any of the doors without an appropriate reason. Altar service–priests, deacons, altar boys–is restricted to males. Females are invited to participate in every other area of church life. Their contribution has been honored equally with that of males since the days of the martyrs; you can’t look around an Orthodox church without seeing Mary and other holy women. In most Orthodox churches, women do everything else men do: lead congregational singing, paint icons, teach classes, read the epistle, and serve on the parish council. Flipping through the Yellow Pages in a large city, you might see a multiplicity of Orthodox churches: Greek, Romanian, Carpatho-Russian, Antiochian, Serbian, and on and on. Is Orthodoxy really so tribal? Do these divisions represent theological squabbles and schisms? Not at all. All these Orthodox bodies are one church. The ethnic designation refers to what is called the parish’s “jurisdiction” and identifies which bishops hold authority there. There are about 1.2 million Orthodox in North America and 250 million in the world, making Orthodoxy the second-largest Christian communion. The astonishing thing about this ethnic multiplicity is its theological and moral unity. Orthodox throughout the world hold unanimously to the fundamental Christian doctrines taught by the Apostles and handed down by their successors, the bishops, throughout the centuries. One could attribute this unity to historical accident. We would attribute it to the Holy Spirit. Why then the multiplicity of ethnic churches? These national designations obviously represent geographic realities. Since North America is also a geographic unity, one day we will likewise have a unified national church–an American Orthodox Church. This was the original plan, but due to a number of complicated historical factors, it didn't happen that way. Instead, each ethnic group of Orthodox immigrating to this country developed its own church structure. This multiplication of Orthodox jurisdictions is a temporary aberration, and much prayer and planning is going into breaking through these unnecessary walls. Currently the largest American jurisdictions are the Greek Orthodox Archdiocese, the Orthodox Church in American (Russian roots), and the Antiochian Archdiocese (Middle Eastern roots). Services will differ in language used, the type of music, and a few other particulars, but the Liturgy is substantially the same in all.